For students in grades 3-8 and high school, March marked the beginning of the Smarter Balanced testing window. Spring 2015 marked the first year Smarter Balanced assessments were administered, and student participation was mixed: For elementary and middle schools, participation rates were at 95 percent across grades 3-8, but high school participation rates were low, as more than 50 percent of 11th graders refused to take the math and English language arts exams. In an effort to communicate with students about the importance of taking these assessments, the Ready Washington coalition launched a student voices project called ‘Opt In for Student Success.’ The project encourages students to use their voice to talk about the importance of a high-quality education, the value of assessments and being prepared for college, work and life. Between now and April 15, Ready Washington is accepting video submissions from high school students around the state. From those submissions, 10 winners will be chosen to each receive a $500 scholarship, and a $100 Visa gift card will be awarded to their favorite educator. Full details are available by clicking here. If you know of any high school students who believe in the value of standards and assessments, encourage them to submit a short video for a chance to win $500. The spring testing window for students in Washington state’s public schools is underway, which means year two of the Smarter Balanced Assessments (SBA). Between now and June, students in grades 3-8, 10, and 11 will take these exams, which include testing in both English Language Arts and Mathematics. Assessment results will give students – as well as their families and their schools – insight into where they stand on the path to career- and college-readiness. Last year saw strong participation on the SBA from students in grades 3 through 8 and grade 10, but more than half of Washington’s 11th graders refused to take the test. Looking to improve upon that this year, the Washington State Board of Education (SBE) has issued the 95/10 Percent Challenge, endorsing two goals: All schools meet the 95 percent test participation requirement established under federal law. And, Washington reduces the number of students requiring postsecondary remedial coursework by 10 percent. “Although full participation is important to ensure federal compliance, the overriding consideration is the ability to monitor and support the progress of all students, particularly those not on track for a career and college-ready diploma. The Roundtable has long supported college- and career-ready learning standards and aligned assessments in K-12 education, and we were encouraged by last year’s Smarter Balanced results. Driving increased student participation in the assessments, particularly among our high school students, is important to improving education outcomes for all Washington students. Too few U.S. high school graduates are academically prepared. That’s the conclusion from a report released this week by Achieve, a national, independent education reform group. The study compares all 50 states and their adoption of college- and career-ready policies based on each state’s standards, graduation requirements, assessments, and accountability systems. These numbers aren’t surprising. As highlighted in the latest release of the Benchmarks for a Better Washington, our state ranks just 39th in the nation in bachelor’s degrees awarded per capita (4.6 degrees per 1,000 residents in 2013). And, in a 2013 report for the Roundtable, “Great Jobs Within Our Reach,” the Boston Consulting Group found that 25,000 jobs had gone unfilled because of the skills gap. That number was projected to grow to 50,000 by next year. 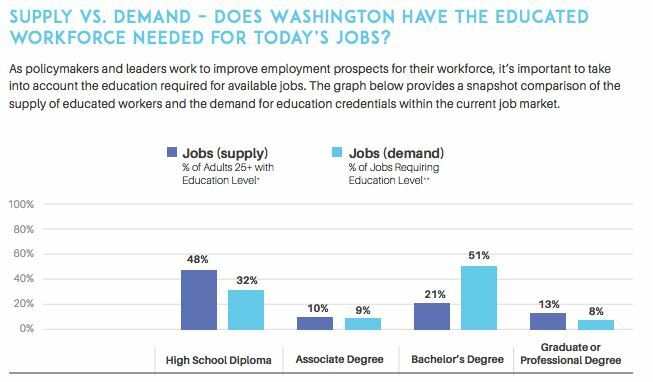 Increasing postsecondary attainment will be a critical step toward shrinking the skills gap and ensuring Washington kids are ready for great opportunities in our state. We’ll be taking a deeper look at these issues in the months ahead. The Washington Legislature came together last week in bipartisan fashion to pass a bill to save public charter schools. We’re thankful to legislators in both chambers and on both sides of the aisle for working together to pass a long-term solution for these schools. This fix will allow for the continued operation of eight charter schools that have already demonstrated impressive student achievement gains. It will also allow for the expansion to 40 total public charter schools in the coming years. This will have positive implications not just for the current 1,100 public charter school students in our state, but for countless Washington families in the future. We applaud the Legislature for finding a solution that works. Act Now for Washington Students is also encouraging voters to thank lawmakers for their great work on this bill and show their support to Gov. Inslee as well. The coalition offers an opportunity for you to voice your support here.